More than 400,000 student loan borrowers may have placed their faith in a government program with an uncertain future. The Public Service Loan Forgiveness Program promises to cancel any remaining student debt for those who work for the government or nonprofits if they have been making on-time payments for 10 years. Many teachers, public defenders, Peace Corps workers, and law enforcement officers fit the qualifications. This October marks the 10th year of the program and the first time anyone will have made enough payments to get their debt wiped away. It's unclear how much the program will cost the government when its starts to forgive those debts. The program has been shrouded in some uncertainty for months. On Wednesday, the Washington Post reported that the Department of Education is planning to propose ending the Public Service Loan Forgiveness Program. The article was based on budget documents obtained by the Post. A public version of the department's budget is expected to be released next week. Congress would have to approve the department's proposed changes for them to take effect. It's unclear whether the Trump administration may propose ending the program for future graduates, or end it for those who have already applied and made qualifying payments. The Department of Education did not respond to CNNMoney's requests for comment, and "had no immediate comment" for the Washington Post. "It would be absolutely detrimental to those of us who have planned our lives around this program. It would be the equivalent of pulling the rug out from under us," said Daniel J. Crooks III, a government attorney who is expecting loan forgiveness from the public service program in six years. He currently has more than $300,000 in student debt -- after making payments for the past four years. He's moved states to get a better job that still qualifies him for the debt relief. Education Secretary Betsy DeVos has said little on the issue of student debt. She praised President Trump's "skinny" blueprint budget released in March for including an additional $1.4 billion in school choice programs. Are you planning to use the Public Service Loan Forgiveness program? Share your story by emailing Katie.Lobosco@cnn.com. Trouble with the Public Service Loan Forgiveness program had already given borrowers a reason to worry. A lawsuit filed in December claims four borrowers were misled into believing they qualified for the program. In court documents, attorneys for the Department of Education suggested that borrowers may not be able to rely on prior notices from their loan servicers about whether they qualify. Many people have told CNNMoney that they are confused about whether they qualify, how to enroll, and that it's difficult to get answers from the companies servicing their loans. "It's one of the more convoluted programs that Congress has designed," said Rohit Chopra, the former student loan ombudsman at the Consumer Financial Protection Bureau. The CFPB has received complaints from borrowers who were told they were not enrolled after years of making payments they thought counted towards the 120 needed for debt relief. You need the right kind of loans, the right kind of job, and need to also be enrolled in an income-driven repayment plan. Signing up for that repayment plan alone requires submitting information about your income each year -- a process which can take weeks and temporarily stop the clock on your 10 years of payments. The program could cost the government more than originally expected, according to the Government Accountability Office. The Obama Administration had proposed capping the amount borrowers could have forgiven at $57,500, but that proposal was never approved and forgiveness remains unlimited. 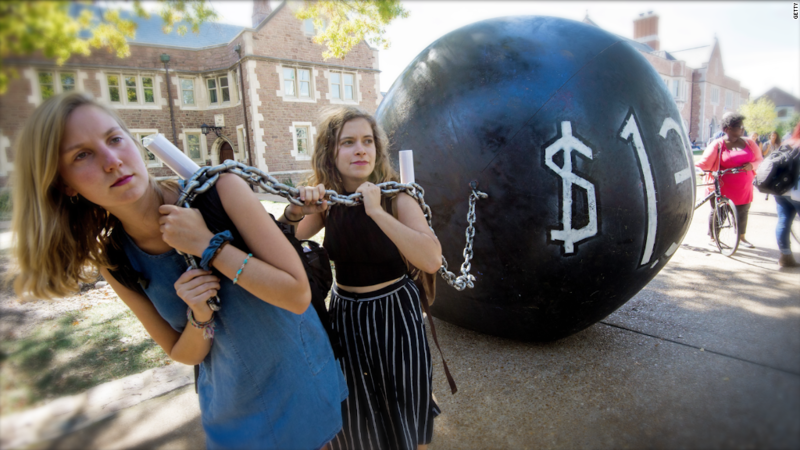 The median borrower in the program has more than $60,000 in student debt and almost 30% of them have more than $100,000 in debt, according to a Brookings report. Even if Crooks can remain in the program, he worries that future grads will be discouraged from entering public service jobs if it's no longer available for them. "With student debt hanging over them, it might not be financially possible for recent grads to commit to public service careers," he said.